The 6G open root was done with a 1/8 E6010 electrode at 83 amps using a whipping technique. Most of the time I was dragging at about 5 degrees while pointing the rod to the center of the pipe. If you do not always point your rod to the center of the pipe and keep the keyhole centered you will get a lack of fusion. In the event that the keyhole is closing up you need to lead the rod at about 5 to 10 degrees. The hard part of the root is the bottom half of the pipe. Overhead rod angle while dragging up hill. Open root vertical up rod angle. 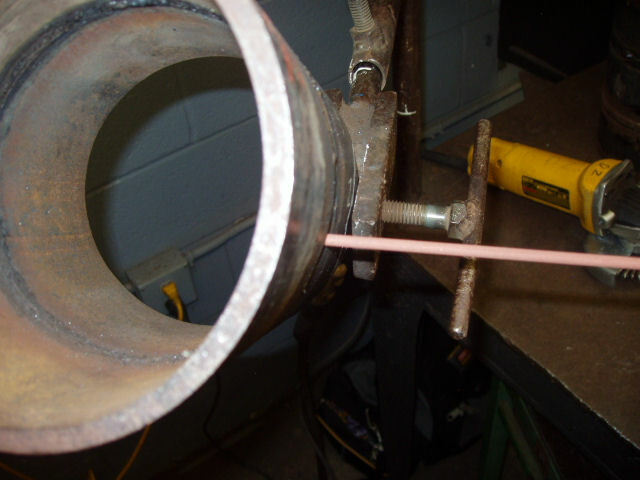 Rod angle dragging the open root weld in the flat position. 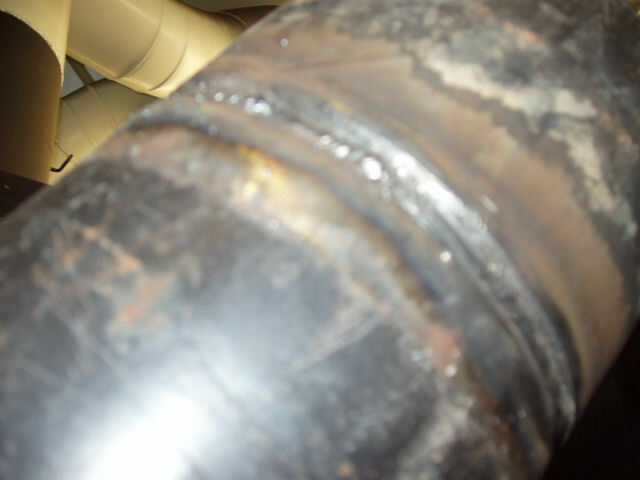 Below are some basic guidelines for troubleshooting open root welds. Above all, when you are not sure about the root, STOP WELDING at once! Increase the angle of the drag. Start to whip the rod in longer motions. Start pushing the rod forehand toward the direction of travel. Increase the angle of the push. Push the rod inside the pipe so the arc is in the inside when welding. The sound of the electrode burning should be coming from the inside of the pipe. Slow down your travel speed. Start to use a Very tight whip that is almost a slow steady motion. You want to give the electrode enough time to properly fill the root. Feather all tacks and restarts with a grinding wheel. Piggy Back all restarts and tie ins at least a 1/4 of an inch. Pause for a second on all feathered edges to burn in properly. When tying in don’t stop welding until you have penetrated the tack and covered most of it. The first part of my root was from the 6 o’clock to the 9 o’clock position. Since I am mainly right handed this is my hard side for the root. What makes it difficult is that I am welding from right to left, so the handle and electrode naturally block my view of the keyhole. What I did was position myself in a way that I can see the keyhole at all times.The downside is it is very difficult to stay in that position without getting any muscle cramps. To start the weld I piggy backed on the 6 O’clock tack while preheated the electrode on the tack. Then slowly whipped the rod until I was on the feathered edge of the tack. Once I could see the weld burning into the feathered edge I paused for a second pushing the rod inside the bevel to let the arc shoot up enough filler metal to tie into the tack properly. After that I was just a simple whipping motion until I got to the 9 O’clock tack. When I got onto the tack I kept welding until I was past the feathered edge. 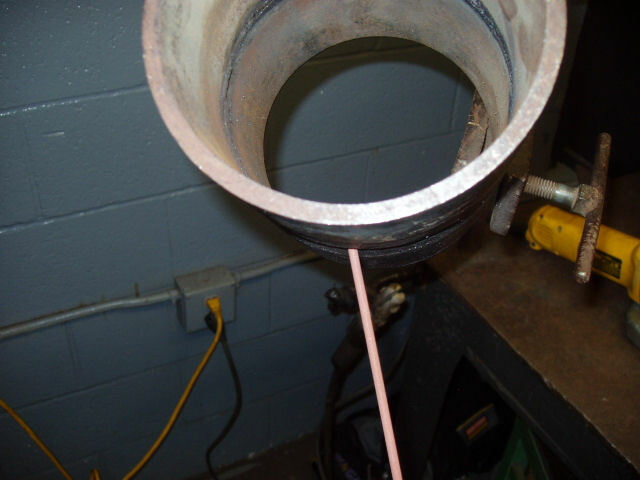 Open root weld penetration from the 6 to 9 o’clock position. The second rod I used was done on the root from the 9 o’clock to the 12 o’clock position. Before starting to weld I used my grinder to clean up the 9 o’clock tack that was piggy backed from the previous weld. Once it was cleaned up I piggyback that tack and started whipping. When tying into this tack I did not pause too much. On the upper half of the pipe gravity is in your favor. 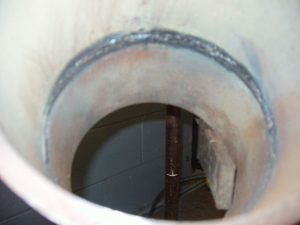 In this case it is easy to have too much penetration on the inside of the pipe. The technique I used was just a whipping motion while dragging the rod about 5 degrees, and above all, the electrode needs to always be pointing to the center of the pipe. When coming up to the 12 o’clock tack I piggyback half way over it. The weld penetration on the 9 to 12 o’clock position. My next root pass was from the 6 o’clock to 3 o’clock position. It is the easy side of the bottom half of the root if you are right handed. This is because you can easily see the keyhole for right handed people. 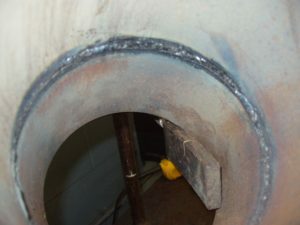 On this side of the weld I used my left hand to lean on the pipe while leaning the electrode on my thumb to guide the rod. Once the electrode burned short enough I slowly took my left hand off of the pipe and went to holding the handle with two hands. Before starting to weld I ground the 6 O’clock tack from the previous piggy back restart. 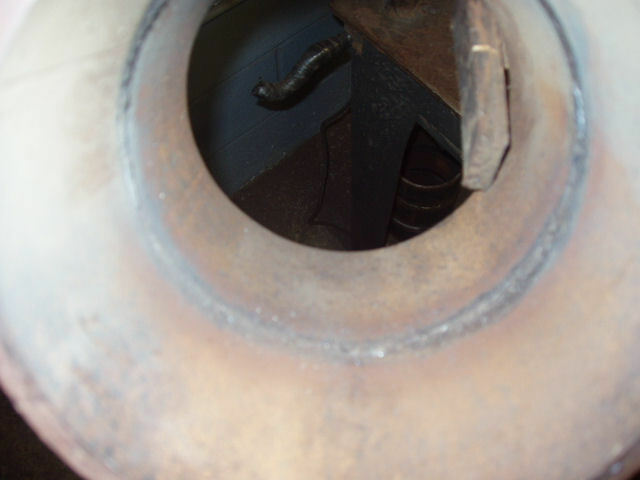 Just like the other bottom half of the pipe I let the rod preheat and paused and pushed the rod into the root when burning into the 6 o’clock tacks feathered edge. After that it was just a whipping motion and then piggy back onto the 3 o’clock tack. The weld penetration of the root from the 6 to 3 o’clock position. My final root pass was done from the 3 o’clock to 12 o’clock position. 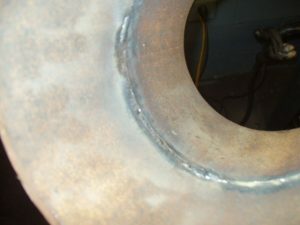 Before starting I grinded down and feather the edge of the 3 o’clock tack where my last weld stopped. On this side of the pipe I had to sit on the table to get a good view, otherwise I would not be able to weld 90 degrees in a single pass. I have a bad habit of making long welds even when I can’t see where I am going. In most cases shorter welds are fine as long as you grind and feather your restarts. Just like the other top half of the pipe I piggybacked the restart onto the tack then let the electrode preheat, burned into the feathered edge, followed by using a whipping motion up to the 12 o’clock tack. Once I got onto the 12 o’clock tack I piggyback half the tack. Root penetration from the 3 to 12 o’clock position. Inspecting the top root weld penetration. 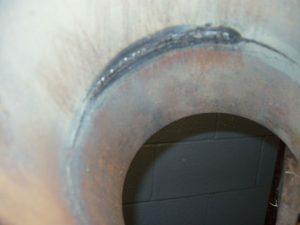 Bottom of the root weld penetration. 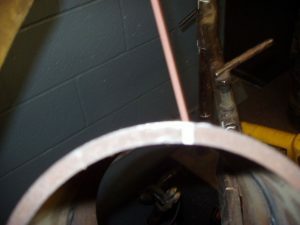 Surface of the open root weld.